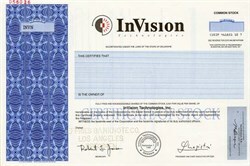 Beautiful specimen certificate from Invision Technologies, Inc. This historic document was printed by the Security - Columbian Company and has an ornate border around it with a vignette of the company name and logo. This item has the printed signatures of the Company’s President and Chief Executive Officer, and Secretary. InVision Technologies, Inc. was a publicly traded company based in Newark, California, that manufactured and sold airport security screening devices to detect explosives in passenger baggage. One of its most well-known products is the CTX explosive-detection device. The company was notable, in part, because its case was the first time the US Department of Justice had resolved an Foreign Corrupt Practices Act (FCPA) case through a non-prosecution agreement.